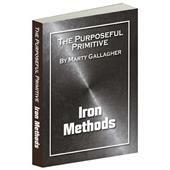 How sure are we that The Purposeful Primitive - Iron Essays (eBook) will work for you? 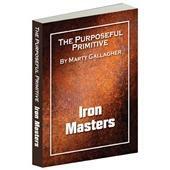 Simply fill out the form below and put The Purposeful Primitive - Iron Essays (eBook) to work for you right now. 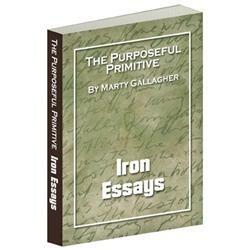 Obviously, we would go out of business if The Purposeful Primitive - Iron Essays (eBook) didn't work, the way we said, right? 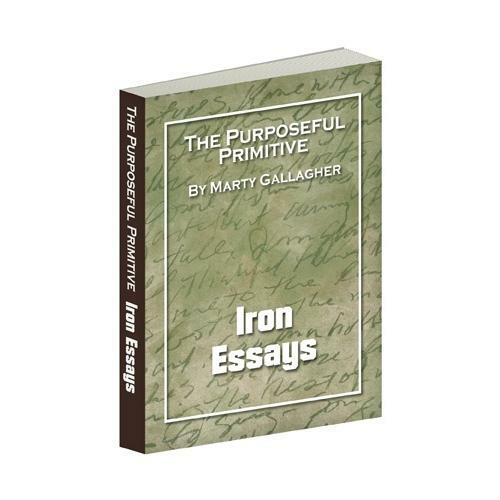 With the promise of a full refund if you're unsatisfied, you have nothing to lose by trying The Purposeful Primitive - Iron Essays (eBook). Go ahead and try it today. 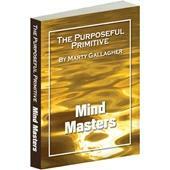 I commenced my own transformational odyssey in 1962 when at age 12 my Irish father bought me a 110 pound set of weights for Christmas. I wanted to transform myself from what I was—an average boy—into what I wanted to be—a muscular giant. I was a daydreamer, a comic book reader, a superhero worshipper and in my mind's eye I would visualize myself transformed into Herculean proportion. As a preteen I read Greek, Roman and Norse mythology and became a sport idolater. 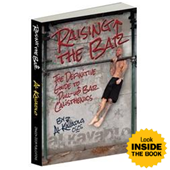 I wanted to become larger than life and instinctively sought out the tool that would enable me to achieve my imaginary physical goal: a barbell. My extremely supportive father enabled me to remake myself by purchasing the weights. He was a widower who worked long and hard and because of his work schedule I grew up with a lack of parental supervision. Being a baby boomer, I had lots and lots of neighborhood mates and cohorts. Preteen males, we formed a roving tribe of "lost boys" and we actively and enthusiastically engaged in all types of organized athletic games. In those days parents sent children out to play; mothers particularly wanted the boys outside to preserve their sanity. Every single day we had enough male participants to form full football or baseball teams. The younger boys stood on the sidelines, anxiously awaiting their turn to be rotated into these massive sandlot games. In this age of high-tech glitz and dazzle, the quest for physical transformation can confuse and confound the most astute and analytical individual. A serious fitness devotee seeks nothing less than complete physical renovation, but awash in a sea of conflicting methods and modes, who can sort the proverbial wheat from the chaff, the real-deal from the jive, the effective from the ineffectual? Commercial gyms and omnipresent fitness infomercials continually churn confusion and purposeful obfuscation, promoting one exercise mode, machine or device after another, endless types and varieties, each presented as "the ultimate." Use of the device, we are told with the easy assurance of the unconsciously ignorant, makes transformation quick and effortless. If rapid and radical physique renovation were so damned easy the planet would be overrun with Arnold-clones and that just ain't so. At some point if you use free weights you'll need to graduate from the pedestrian "exercise set" to an Olympic style barbell. The ball-bearing sleeves allow smooth, non-binding rotation of the load and the seven foot length is necessary for use in a power rack. Downside: the empty bar weighs 45 pounds so for exercises requiring less poundage you'll need to use dumbbells. People often ask, "How long should a resistance exercise session last?" Is there a tipping point, a point of diminishing returns where energy nosedives so dramatically that further exercise effort is futile, if not downright counterproductive? The answer is yes. Experience and science converge on this one. After 45 to 60 minutes, for someone in reasonably good condition, energy starts to fade quickly, strength plummets and performance begins to suffer so badly that logic dictates that the session should be ended. Any athlete that has played for a winning team knows that a group of athletes can develop a collective synergy that needs to be experienced to be truly appreciated. The optimal group dynamic creates a hurricane of momentum as players play over their heads and exceed realistic expectations on a routine basis. As a result of athletic synergy the grand total exceeds the logical sum of the combined individual parts. Team synergy can be replicated in resistance training by lifting with like-minded, highly motivated individuals regularly and repeatedly. A training partner, or better yet, a group of training partners, accelerates gains way past your wildest imaginings. If the chemistry is right, if the person or persons pushes you and demands the best from you, if they do so without being reckless or hurtful, if they inspire you to do more than you would on your own, and do so without veering into injurious training practices—you are in for the most productive physical training period of your entire life. It is a predictable phenomenon and for this reason the athletic elite cluster together to train. It's only natural for the strong and capable to seek each other out. Recently I've had to do something I hadn't done in decades: introduce folks who've never lifted weights in their entire lives to my peculiar ways and methods. Working with clinically obese folks caused me to undertake an unexpected reexamination of my own Purposefully Primitive methods and procedures. Could I break the basics of an already ultra-basic system down even further? Was it possible to create a framework sparser than the spare template already in place? Could I create a skeletal framework so limited that it could be used effectively by the untrained; people who work full time jobs, people with large families and lots of responsibilities? How simple can you make the physical renovation process without losing effectiveness? My back-to-basics immersion caused me to deeply reconsider procedures and philosophies done for so long and so regularly that, in some cases, I'd forgotten why I do things the way I do them. I've lifted weights since the age of twelve and at age 57, I've accumulated 45 years of hands-on, in-the-trenches experience. That's good and bad. Anytime a person does something for that long they tend to get pretty damned good at it. On the downside they tend to become a bit dogmatic, automatic and pedantic. Elemental modes and procedures should not be taken for granted. It had been a long time since I'd pondered how, what and why I do what I do in the way that I do. Ron: Started off weighing 241 pounds standing 5'9." This 48 year old Mack Truck factory worker was able to squat 95, bench press 95 and deadlift 135 for reps on day one. On day 88 Ron squatted 245, bench pressed 225 and deadlifted 400 weighing 175 pounds. Ron took 3rd place in his age and weight division at the 2005 AAU World Powerlifting Championships. Betty: Started off weighing 305 pounds standing 5'2." This 61 year old grandmother was unable to walk 50 steps without stopping to catch her breath for 15 minutes. She was unable to perform a single squat with zero weight. She could perform one incline pushup with no weight and was unable to squat down to grab a deadlift bar. On day 88 she won her age group at the AAU World Powerlifting Championships with a 205 pound squat, a 100 pound bench press and a 195 pound deadlift. She was able to walk the circumference of a 154 acre farm without stopping and weighed 264 pounds. Connie: Started off weighing 183 pounds standing 5'3." This 39 year old mother of five boys was able to squat and deadlift 75 pounds on day one and bench press 40 pounds. On day 88 Connie won the AAU World Powerlifting title weighing 148 pounds. She squatted 185, bench pressed 145 and deadlifted 185. In training she had bench pressed 95 for 10 reps.
Jen: Started off weighing 305 pounds standing 5'8." This 33 year old computer programmer on day one was able to do 10 incline pushups with no weight. She was able to perform one full squat with no weight and one deadlift with the empty 45 pound barbell. On day 88 Jen won her weight class at the AAU Championship squatting 200, bench pressing 105 and deadlifting 280 before barely missing 300. She weighed 271. Physical progress is an ebb and flow proposition. The only surefire bet in the world of fitness-related pursuits is that all progress eventually grinds to a halt, no matter how sophisticated the program or how great the individual effort. Proper training and effective eating favorably alters the shape and composition of the human body. It does so by imposing biological imperatives. Do this and that will happen: simple scientific cause and effect. The biological imperative is the physical expression of the Hegelian Dialectic: thesis, antithesis, synthesis. The status quo thesis (your body as it is) is impacted by something radically different, the antithesis (a new system of training/nutrition.) Eventually that which was once radical and different morphs into the new status quo and becomes the synthesis. The synthesis becomes the new thesis and the process repeats itself. Generally speaking most exercise and diet routines lose effectiveness after 4-6 weeks, but this can vary. Knowing when to change comes with experience. The more training cycles you have under your belt, the better you'll be at identifying the signs of stagnation. Don't use change as an excuse to change every thing every week. Three to four weeks is the absolute minimum to stay on a selected course. Anything less and you can be accused of not giving the approach a decent tryout. Humans are creatures of habit and when left to their own devices prefer to follow a path they know. The iron elite are attuned to the body's subtle rhythms and patterns and they know that blind allegiance to a particular system, mode, methodology or approach is progress suicide. In my experience there are two distinct types of post-weight training aftershock: Direct muscle soreness (DMS) and deep muscle fatigue (DMF.) Both are the result of training intensely enough to trigger muscle hypertrophy. High repetition training is the culprit for DMS: I have never experienced "sore to the touch" muscle trauma using low rep sets, even when using multiple sets. Direct muscle soreness is fiber trauma related to high repetition training. 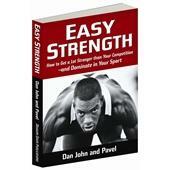 DMS is caused by performing high rep sets that equal or exceed capacity in some fashion. This type of training creates intense muscle soreness that is a result of cellular micro-trauma. Compound multi-joint progressive resistance movements done with a barbell or a pair of dumbbells are without question the most effective exercises ever devised for building muscle. No system of exercise produces the muscle growth free weight progressive resistance training delivers. This is a flat statement of undeniable scientific fact. In my opinion the most effective single progressive resistance routine ever devised specifically for building the muscles of the back are progressive pulls. I was exposed to this routine around 1965 in an article in Strength & Health magazine. In the interceding decades I've added a few subtle twists. 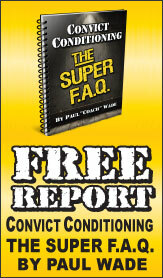 Anyone that I've gotten to use this program the way it is supposed to be used has gotten fabulous results. I once received a lesson in power and strength that lasted less than 15 seconds and provided me mental fuel that has burned for twenty years. In the mid-1980's I was at a powerlift competition coaching a friend. Coaching another lifter was George Hechter, the number one ranked heavyweight lifter in the world at the time. He was a smart, sharp guy and a protege of iron icon Bill Starr. They say that variety is the spice of life. In the world of resistance training this old cliche is often used as an excuse to avoid mastering tried and proven ultra-basic free weight exercises. Training with barbells and dumbbells using compound multi-joint exercises remains the most effective way ever devised for growing and strengthening muscles. My name is Grill so they call me Grill Man. I'm 6'2" and weigh 350 pounds. I have a 14% body fat percentile and can dunk a basketball with either hand. My goal is to deadlift 800 in a powerlifting competition. I have done 771 officially and 780 in training. So I'm close. I'm serious as a heart attack when I walk into the gym. I go to the local Steel House at the same time of day every day five days a week and have done so for 15 straight years. Back in the late eighties I ended up taking a job in Bridgeport, Connecticut. Anyone from Connecticut knows Bridgeport was one rough freaking place. Incongruously a yacht club had sprung up next to a waste recycling plant in the heart of Bridgeport, right next to a notorious ghetto housing project. My friend Bobby relocated to Connecticut to take a job working for his brother's import/export firm. He asked me to help crew his 28 foot, twin-screw Sea Ray from Deal, Maryland to its new home at the Bridgeport Marina. It was a terrific trip and as it turned out, it was a ploy by the brothers to lure me into taking a job with their firm. They enticed me by paying me way more than I was worth to do way less than I was capable of. On the first day at the new job Bobby walked into my office. I was nervously unpacking my stuff and trying to get my bearings. In 1983 I had a horrific power accident at age 33: I was squatting with 700 for reps on a light day without spotters. After all it was only 700. Anyway, it was a hot and sticky day and my T-shirt was soaked. The bar slipped down my back. I was about to toss it backward and leap forward when a well-intentioned buddy saw what was happening and leapt to my assistance. It was a nice gesture at precisely the wrong time. He tried to wrestle the barbell while standing behind me. He wanted to save me. There is no way anyone is going to prevent gravity from taking 700 exactly where it wants to go: straight down. He and I got tangled up and I took the full brunt of 700 pounds dropped from four feet across my left lower leg. It snapped like a match stick. I had squatted 840 the previous week weighing 250 and thought I had a real shot at breaking Danny Wohleber's 871 world record in four weeks at the nationals. That accident effectively ended up my career as a powerlifter, at least for the next decade. I made a comeback as a master lifter (over 40 years of age) at age 42, but I never hit the heights I'd achieved before the injury.